them* and believed in ­Jesus. i­sees said to each other, “There’s nothing we can do. went together to ask ­Jesus. many new kernels—a plentiful harvest of new lives. 25 Those who love their life in this world will lose it. am. And the Father will honor anyone who serves me. angel had spoken to him. will draw every­one to myself.” 33 He said this to indicate how he was going to die. from a Hebrew expression that means “save now.” 12:13b Ps 118:25-26; Zeph 3:15. 12:15a Greek daughter of Zion. 12:15b Zech 9:9. 12:17 Greek were testifying. 12:19 Greek the world. 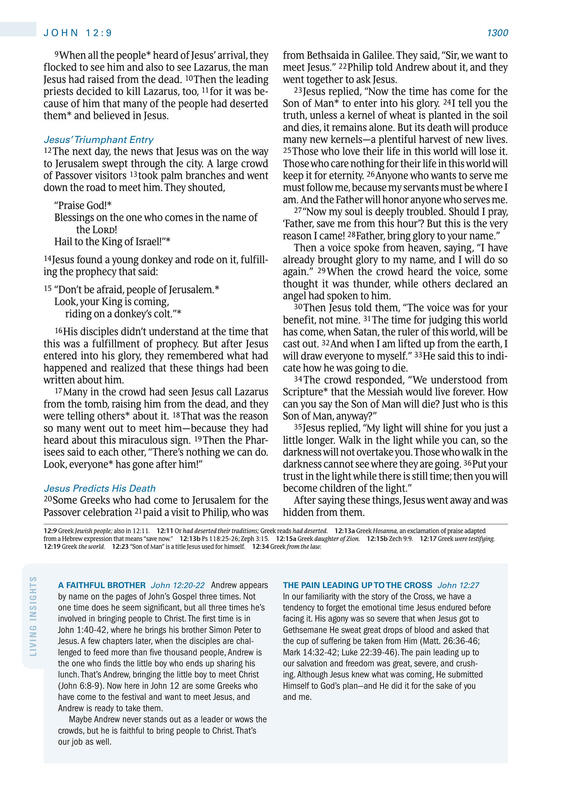 12:23 “Son of Man” is a title Jesus used for himself. 12:34 Greek from the law. Andrew is ready to take them.